Dolphins in a bay are like canaries in a coal mine. 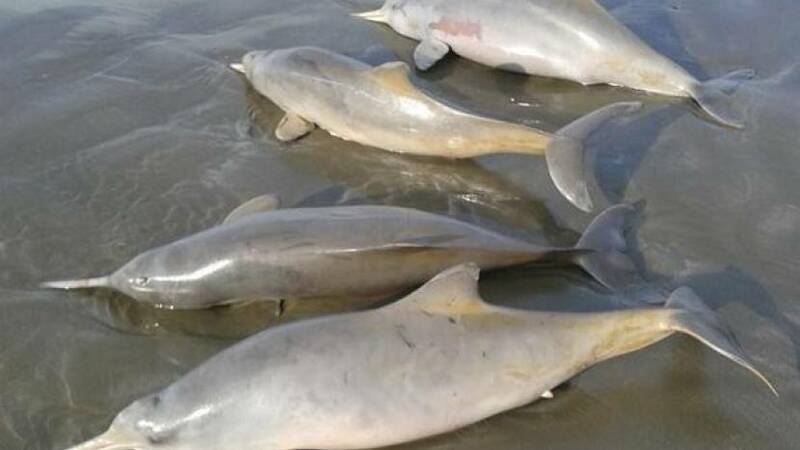 In Sepetiba Bay in Brazil, hundreds of dolphins have recently died. Scientists have discovered more than 200 dead Guiana dolphins over the past few months in the bay, according to a new report by The New York Times. The deaths were reportedly caused by a virus related to measles. This virus typically might kill only a handful of dolphins-and never before in the South Atlantic. But now, bloated, scarred, deformed and emaciated carcasses are turning up everywhere in the bay near Rio de Janeiro. The culprit, morbillivirus, causes rashes, disorientation, fever, respiratory infection and, in these cases, an agonizing death. Development in the region may have made the problem worse, according to the Times. A mining company dumped pollutants into the water in the 1990s, and although that company closed, there was a burst of new businesses opening right afterwards. Fishermen have seen declines in the populations of other animals in the bay as well, making it difficult for them to catch enough to eat and sell. However, dolphin deaths are particularly noticeable, and dolphins are especially vulnerable to pollutants because predators that eat other animals can develop a higher concentration of whatever toxins their prey has eaten. "When something is wrong with them, that indicates the whole ecosystem is fractured," Mariana Alonso, a biologist at the Biophysics Institute at the Federal University of Rio de Janeiro, told the Times. Alonso is one of the scientists who is working to identify what caused the epidemic and how it can be prevented in the future. This incident is reminiscent of the mass die-off that occurred among saiga antelope in the spring of 2015. About 200,000 endangered saigas died unexpectedly from a bacteria that is usually not fatal. However, the particularly warm and humid climate made the bacteria grow out of control, overwhelming the animals and killing more than half of their global population.